The Court of Justice of the European Union (CJEU) has ruled that a part-time recorder (fee-paid judge) should have his pension backdated to include his service prior to the introduction of a UK law that enabled him to accrue a pension (Part-time workers less favourable treatment (PTWLFT)) regulations. The PTWLFT regulations came into force on 01 July 2000 and the Association was the first union to submit employment tribunal claims on behalf of its members on the implementation date (another union followed some four months later). Handing down its decision (7 November 2018), the CJEU said that the periods of service completed prior to the deadline for implementation of the EU Directive must be taken into account for the purpose of calculating O’Brien’s pension. The full written decision has yet to be published but the decision of the CJEU could provide a pension entitlement to our members who were employed by their local FRS prior to 01 July 2000. In anticipation of this judgement, we have ensured that all of the tribunal applications submitted by the Association have remain ‘stayed’ to provide the protection of our members. Please be assured that we will continue to monitor the situation and take legal advice as to the opportunities available to us on behalf of our members. We will provide a further update when further information becomes available. 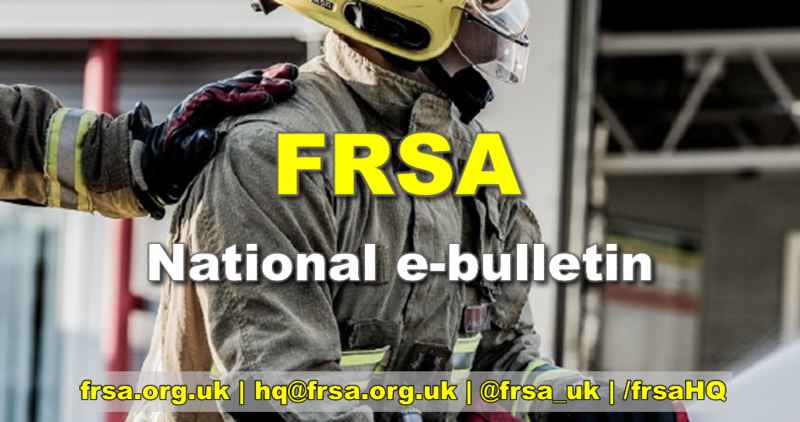 The Association has undertaken a piece of work whereby we have written to services across the country requesting that action is taken to reimburse ex-firefighters who were wrongly taxed on their Ill-health pension after retiring due to a qualifying injury. We have been successful in a large number of cases but we wish to ensure every single individual who is entitled to a tax-rebate receives their entitlement. If you or someone you know is eligible please do not hesitate to contact FRSA HQ. We welcome the news that ‘The Assaults on Emergency Workers (Offences) Act 2018’ received Royal Assent on 13 September 2018 and came into force on the same date. The Act is a response to the increase, in recent years, in the number of assaults on emergency workers. There were 26,000 assaults on police officers in the past year. 15.2% of NHS staff responding to the NHS staff survey say they have experienced physical violence from patients, relatives or the public in the past year. Assaults on prison officers rose by 70% in the three years to 2017. There were 933 incidents involving an attack on firefighters in 2017/18, the highest recorded figure since data was first collected in 2010/11. The Ministry of Justice has provided the FRSA with a circular that provides guidance on the Act’s provisions. The National Fire Chiefs Council’s (NFCC) UK Research and Development team has commissioned a study to look at health and contamination of firefighters and fire instructors in the UK. The study concerns the core temperatures, heart rates and levels of contamination experienced during different types of fires. This study involves providing some blood and urine samples, wearing a core temperature ear piece and logging all exposures over a 6 month period. The team, supported by UKR&D, are now actively looking for volunteers to take part. This is a national study but will focus on the South East of England due to logistical requirements. The Association supports this study and recommends for anyone in or around the South East of England to volunteer to take part in the study. Further details can be found here.